My North American friends tell me that today is Thanksgiving Day. I, for one, have a lot to be thankful for. Just being here for is one, having the privilege of living and working here in this amazing facility set in such an extraordinary landscape is another, and sharing the experience with such a great crew is a third. 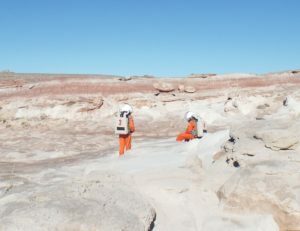 I am also very thankful to the Mars Society and the director of MDRS Shannon Rupert for the opportunity. Today Yusuke, Aexandre, and I went on a scouting EVA along a former access track that is now impassable. It was certainly a good day to be alive. 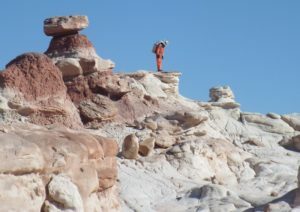 We were able to walk through a part of the MDRS area that I had not been to before. We scouted for lichens and hypoliths and explored the geology. The sandstones and siltstones of the lower part of the Morrison formation were here redoing back along a low lift line, leaving behind some extraordinary pinnacles and pedestals. We hunted unsuccessfully for lichens, normally a common feature of north-facing rocky outcrops here, and pondered why this should be the case. We searched quartz pebbles in gravels for hypoliths, and found some. Whether or not they come from cultures that celebrate a formal Thanksgiving day, I am sure that future Martian explorers also will be thankful for the opportunity to be there, to explore the amazing martian landscape, and to further expand the horizons of human experience.